Counter programming to Al Gore's 'Dirty Weather Report' will be on WUWT-TV Live starting Wednesday Nov. 14 at 8PM EST | Watts Up With That? Click image for the test feed. Former Vice President Al Gore will be conducting an IAmA this thursday (11/15) at 1 PM Eastern Time! You can see his tweet confirming it here. So get your questions ready for the man who spent 8 years in the Clinton White House, ran against George W. Bush (and beat him in the popular vote), and is now one of America’s leading advocates for the environment. He will be posting in /r/IAmA, so save your questions for Thursday. UPDATE2: The press release below hit PR Newswire here. UPDATE3: The schedule has been posted here. Al Gore is forming another 24 hour media event on November 14th, focusing on “dirty energy=dirty weather”, which you can read about here. It is yet another example of what has been called “Tabloid Climatology” trying to use the once forbidden “weather is not climate” meme. Now almost any weather event seems to be used as “proof” of a global warming influence where just a few years ago the idea was laughed at by climate activists. Mr. Gore’s program is yet another transparent politically based attempt to link climate and weather, and to make people fearful of common weather events that we’ve seen all throughout history. WUWT hosted a 24 hour counter event last year, thanks to the talents of our contributing cartoonist, Josh. You can review that here. Due to Mr. Gore broadcasting fabricated and impossible to replicate science experiments, and then failing to correct the video even when glaringly obvious falsifications were pointed out, and partly due to WUWT’s founder Anthony Watts recent interview (and backlash) on PBS Newshour, a donor has stepped forward and offered to equip WUWT for professional Live TV over the Internet and has purchased a complete web enabled TV studio setup for use this year, seen here. It includes two cameras, live video over net input, and live graphics/slideshow input. It has been tested and has succeeded a 24 hour live web broadcast burn in period. When in production, the WUWT-TV web channel will have all of the elements of a professional TV production. While it won’t match the well-funded technical quality of Mr. Gore’s CurrentTV operations, it will offer a wide variety of viewpoints to counter the claims that “weather is now climate” that Mr. Gore is making. During the live event Wednesday and Thursday, WUWT-TV will be able to conduct live video interviews via Skype online video, plus will feature simultaneous PowerPoint presentations run in high quality HD to go with the live interview, while the guest narrates. These can be full screen or split screen depending on the setting. Guest presentations will be pre-loaded into the live on-air system, and to facilitate remote control, WUWT has engineered a remote ‘web clicker’ that allows guest presenters to control their presentation from their end, using a web page with a forward and back button on it. WUWT-TV has invited a number of individuals to give presentations. A list follows. A schedule for speakers will be posted on WUWT the day of the event, along with important updates. Check www.wattsupwiththat.com for details. November 13, 2012 in Announcements, Gore-a-thon 2012. Tags: Al Gore, CurrentTV, Dirty Weather Report, Watts Up With That? Nice to see Prof. Frink is not part of the 97% !!!! Getting close to airtime now. I’ll be watching as much of it as I can. Sent a copy of this to the news desk at The (Glasgow) Herald. Not holding my breath until a result appears in print, though. Aaaaargh! Please tell me there’ll be a recorded link I can watch later, it’ll be 3:00 a.m. here and I don’t think I’ll make it live. Great list of guest presenters. So psyched that Burt Rutan is going to be on. Great job Anthony!!! Please have an answer ready to debunk the notion that the eclipse in Australia tomorrow will be caused by CO2. Work is going to make me late for the show but I will catch up “post presentation”. Novembers are hard on the “Believers” it seems. Climategate, Algore’s BS, TwentyEightGate. There is something about November. Damn, half way through doing my video spoof. Next yesr for sure. I would quible with the cartoon at the top. There is observational / empirical evidence for how much the global temperature is warmed by CO2 (all other things being equal). It is the basis for mass balance calculations in blast furnaces. These too are based on calculations and models. If CO2 did not absorb energy, one would need more coke to make steel. The mass (and energy) balances work and part of the basis for them is the amount of CO2 and water. The relationship is very well documented. Science tells us that the rules are not affected by location. If it happens in a blast furnace, it also happens in the atmosphere. To the same degree and following the same rules. I cannot watch for the whole time, will individual sections of the program be made available after they have aired live? Where would we be able to find them? Is there a possibility that links to the live broadcast, and individual sections can be posted somewhere comvenient so that I might be able to forward them by e-mail to friends and family? I have bought a new 2Tb USB hard drive to record the whole thing on. Is Dr. Gray, father of hurricane science, too old? Your post at November 13, 2012 at 8:32 am is plain wrong. blockquote>There is no empirical/observational evidence for how much extra CO2 raises the global temperature. It is all based on calculations/models. There is observational / empirical evidence for how much the global temperature is warmed by CO2 (all other things being equal). because “all other things” are NOT “equal” when something alters in the climate system: the change affects everything else. The formatting of my response to John Eggert went wrong. This is a (hopefully) corrected resubmission. There is no empirical/observational evidence for how much extra CO2 raises the global temperature. John, blast furnaces have neither clouds nor hydrological cycle. Anthony is right because predictions from climate models are instead non-predictions and non-falsifiable. saying the climate causes the weather is akin to saying a bowlers AVERAGE determines the score of his next game, that his average changes BEFORE the scores he bowls change(the OPPOSITE of reality), or that a baseball hitters average determines the outcome of his next at bat again the opposite of reality. remember when your house used MORE energy than the state you lived in??! Great to see that “Dr.” Kenji is part of the lineup. Mr. Gore will not have a canine reply to that one. I am sure that Kenji will sniff around and find a bone to pick with the “Prince of hot-air”. Rather than barking up the wrong tree, Kenji will undoubtedly take a nip out of the IPCC imposter’s big fat laureate and raise a leg to his Nobel impertinence. I trust he will be getting a full hour spot. It will bring balance to the broadcast to hear from at least one speaker who is part of a warmist propaganda organisation. Perhaps you could a thread here called “spot the BS”. Any easily countered untruths could be exposed live on air. TV stations will be envious of the viewing numbers. Well done. Skeptics don’t do themselves any favors when they deny that there is evidence. the question is what can one conclude from the evidence and what, if anything, should we do in light of this evidence. There is empirical evidence ( not logical proof) that doubling c02 will increasing forcing by 3-4watts (3.7 is the best estimate. ) This evidence is lab based and field measurement based. We engineer working products based on the physics.There is no credible experiment or physics which contradicts this understanding. Overturning this part of climate science would win you a Nobel prize. much, if not all we know about radiative transfer would have to be rewritten. The response of the climate system to 3.7 additional watts is less well known. It ranges from about 1C to 6C. a big spread. The estimate of 1C to 6C is based on. are in the correct ballpark. So to recap there are two parts to the evidence chain. 2. The climate response to additional Watts. That’s were the debate happens. between 1C and 6C. I hope the BBC covers your presentation, Anthony! This looks like a fantastic list of presenters. What a pity I have to work. Have you thought of using iTunes to offer up this content later? No doubt Apple is an enthusiastic charter member of the Carbon Cult but if you charge for the download and they get their cut they might ignore such a petty matter as doctrinal differences. It is the basis for mass balance calculations in blast furnaces. These too are based on calculations and models. If CO2 did not absorb energy, one would need more coke to make steel. Those of us versed in the topic do not dispute that CO2 absorbs (and re-radiates) energy. A blast furnace however is a bounded system. The processes within it are not comparable to the sheer scale of the atmospheric column, nor can they mimic additional processes such as condensation, evaporation, convection, hadley cells, air and water currents, tides, natural oceanic oscillation and many other major elements of climate that must interact with CO2. The comparison is of little value at best and highly misleading at worst. I see some replies to my earlier post. One arguing that all other things are not equal. In answer to that, all other things are never equal. When one performs an energy balance, one looks at each component (radiation, convection, conduction, phase change) separately. The cartoon directly refers to CO2. Not clouds, convection, lightning etc. Regarding clouds. There aren’t always clouds in the atmosphere either. As for the hydrological cycle. Not relevant to my comment. Increasing CO2 will increase the amount of radiant energy absorbed in an atmosphere. Increasing the amount of energy in a system generally results in an increase in temperature. In the battle to counter the alarmism that Gore is trying to promulgate, we must accept things that are proven. And it is proven that CO2 absorbs radiant energy. It is actually a relatively easy relation to derive, if one has a background in physics and has studied heat transfer. See my article “The path length approximation” if you want to see one way of doing it. re your post at November 13, 2012 at 11:34 am. The caption in the cartoon is correct. Indeed, if you think about what you wrote then you will see you admit it is correct. As you say, there is empirical evidence for radiative effects. However, that says nothing about the behaviour of the climate system in response to changes to those effects, and you admit this when you state your point 2. It is correct and nothing you say provides any doubt to it. Your post at November 13, 2012 at 11:48 am completely misses the point of my rebuttal of your mistake. Indeed, it repeats your error. No rational person disputes the radiative behaviour of atmospheric CO2. And the cartoon caption you don’t like does not dispute it (and does not mention it). Please read the comment of davidmhoffer at November 13, 2012 at 11:46 am. It uses different words but says the same as my post which failed to make the point in a manner which you could understand. Warmists at the Guardian used to tell me repeatedly that the weather is not the same as climate (which I know) when I pointed to snow in Brasil and Saudi Arabia etc. Today, they have done an about face. At least George Monbiot thinks that Warmist scientists are stupid. Now we are being asked to commit ourselves to the wilful stupidity of extrapolating a long-term trend from a single event. In the meantime Monbiot has to deal with an angry Lord. Methinks the pigs are fuelled, armed, and ready for take off, preparing not merely to fly, but to loop the loop, with a barrel roll at the top! Even in the current mess they’re in – shedding top Nebbies almost daily, and with a dilettante politico-journo, ex-Governor General of Hong Kong [“Fat Pang”]a t the helm – coverage of Doubting Thomases [about the credo of CAGW] is too much. It may never come – and don’t expect it to come this week. But all power to your elbow, Anthony. I’ll see some of it – sleep and work will preclude much, I fear. Those of us versed in the topic do not dispute that CO2 absorbs (and re-radiates) energy. So you too quible with the cartoon then? Because the cartoon certainly does dispute it. My simple example is a direct challenge to those who dispute that CO2 absorbs radiant energy. And there are many who do. So to those people I ask: Why then do my blast furnace calcs work? Believe me David, I’m hardly an alarmist. Anyway, (if I’ve calculated correctly) I’ll be asleep for the first few hours but look forward to tuning in later. Mr Eggert in our blast furnaces at my work we are more interested in the CO levels to remove the oxygen from the iron. In fact we add bunker C oil emulsified with water injected into the furnace to increase those CO levels. CO2 is not a primary gas in the bast furnace but a byproduct of the reaction. I would quible with the cartoon at the top. There is observational / empirical evidence for how much the global temperature is warmed by CO2 (all other things being equal). No. You have identified that there is theoretical prediction of a forcing. That is not the same as empirical evidence of warming. Anthony is correct. It is not immediately obvious that the image at the top of the post is a link to the streaming content. Great event. Need as many as possible to catch it. Put a sticky on the front page with an obvious and direct like to the the streaming content. I am not commenting on the cartoon, or disputing the fact that CO2 absorbs and emits IR. But the planet has been falsifying your conjecture for the past sixteen years. Further, Dr Ferenc Miskolczi , a noted climatologist, shows pretty convincingly that the effect of 2xCO2 is 0.0ºC. He certainly knows more than I do about the subject. And Prof Richard Lindzen thinks that the effect of 2xCO2 is pretty small. Lindzen’s estimates have been ratcheting downward over the years as he learns more. I don’t know who is more correct. But it is clear that the added CO2 has not caused any effect distinguishable from complete natural variability, as the Null Hypothesis shows. So please explain why, with the very substantial rise in CO2, there has been no statistically significant global warming over the past decade and a half. Something is wrong, missing, or overlooked in your conjecture. Finally, there has been no acceleration of global warming since the Little Ice Age. The long term rising temperature trend is not accelerating, despite a ≈40% rise in CO2. Thus, CO2 has not made any measurable difference, whether the CO2 concentration was low or high. The long term trend remains the same irregardless of CO2 levels. I think you need to re-think your premise. The real world is not in agreement. No I don’t because that’s not what it says. And for pities sake, itz just a cartoon. I would quible with the cartoon at the top. There is observational / empirical evidence for how much the global temperature is warmed by CO2 (all other things being equal). It is the basis for mass balance calculations in blast furnaces. No it is not. Mass balance in a blast furnace is not calculated with climate models. The relationship is very well documented. In blast furnaces. The text of James Hansen’s protest signs notwithstanding, the earth’s climate system is not a blast furnace. Science tells us that the rules are not affected by location. No, science does not tell us that. Science often assumes that. For a great many purposes, that assumption is workable. However, there is some discussion that even fundamental phyicial “constants” may not be … uh … constant … over space and time. If it happens in a blast furnace, it also happens in the atmosphere. Funny. This morning I shoveled snow from my front walk. I didn’t run into any clinker. How often do you plow your furnaces? To the same degree and following the same rules. Not to the same net effect, as the systems are entirely different. Your argument, and Mosher’s concurrence, are merely dolled up versions of the “It’s basic physics” meme. Sorry. The earth’s climate system is not basic physics. It is very complex physics. And chemistry. And biology. None of which is adequately modeled by existing GCMs, let alone by a blast furnace. I do not deny there is evidence. I disagree with Richard Courtney. There is evidence, but it is negative evidence; it does not prove anything. There is strong evidence that CO2 concentrations in the atmosphere started to increase abnormally around 1970. If CAGW is correct, then global temperatures should have started increasing abnormally at around the same time. There is no evidence that global temperaturess are behaving abnormally. On the contrary, global temperatures are behaving exactly as they have been doing for centuries. See http://www.vukcevic.talktalk.net/MidSummer-MidWinter.htm and http://bit.ly/V19Im8. So the negative evidence is that adding CO2 to the atmosphere has no effect on global temperatures. The total climate sensitivity of CO2 seems to be indistinguishable from zero. This does not prove that some time in the future, global temperatures will not suddenly start to increase as a result of CAGW. CAGW is an extremely plausible hypothesis, that no-one can prove is incorrect. But the question you will not address is how long do we have to wait for a CO2 signal to appear in the temparture/time graph, and when no such signal appears, do we conclude that no CO2 signal is ever going to appear? 1) He has a mansion in Tennessee that is four times larger than the average new American home and uses over 10 times the electricity. 2) Not content he buys a new Montecito Villa for $8.875 Million that is 6,500 sq. foot with 6 bedrooms, 9 bathrooms, a large pool house, 6 fireplaces, wood framed french doors, and carved stone detailing throughout. Some say it has sea views. 3) Start bailing from Green investments according to an SEC report. After his family got rich on ‘dirty’ Occidental Petroleum stock he bailed out having been called a hypocrite. Who believes anything Al Gore has to say about the weather or the climate? Gore now wants to put carbon tax into the “fiscal cliff” negotiations. ‘Cause they won’t be hard enough as it is. I hate to agree with Steven Mosher, but he’s right. There is some observational/empirical evidence. There’s no CONCLUSIVE observational/empirical evidence for how much the global temperature is warmed by CO2. The point is the conclusion has been jumped to with insufficient evidence, not no evidence at all. The mere rising of temperatures and rising of CO2 is observed evidence, it would be a logical fallacy to conclude causation, but it’s still evidence. 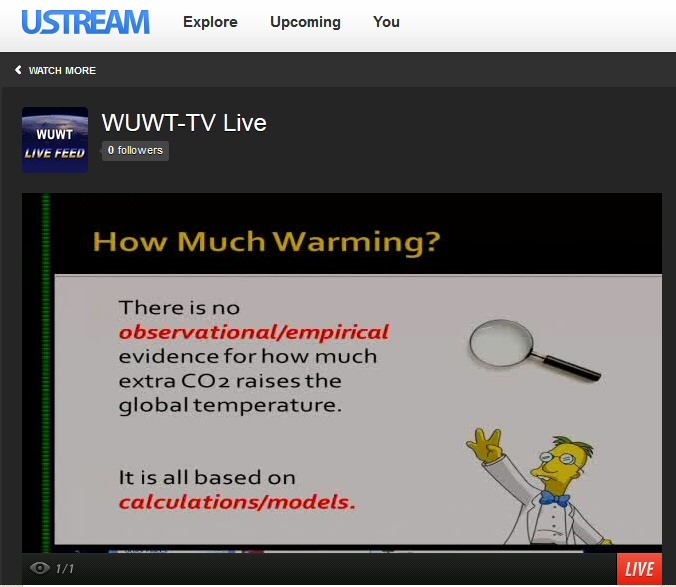 Matthew W says: Nice to see Prof. Frink is not part of the 97% !!!! Looks like the moment he shouts, “Pi is exactly 3”. Which of course it can be, depending on your choice of units. The short answer to your queries have been given by others. The direct effect of the 1.5 C or so that results for a doubling from 200ppm to 400ppm is almost certainly masked by much larger effects independant of CO2 (milankovitch cycle, changes in solar activity, volcanism, etc.). Steve Mosher believes that the effect of doubling from 200 to 400 is equal to the effect of doubling from 400 to 800. I’m not sure if MODTRAN shows this or not. Certainly the HITEMP database shows that in things other than climate the impact of increasing CO2 goes to 0 at concentrations beyond the atmospheric equivalent of 800 ppm. In a blast furnace, when the path length (concentration of CO2 times distance) increases beyond 500 bar cm, the change in absorption becomes negligible. At 200 bar cm (around 300 ppm in the atmosphere), the change begins to flatten. At the current levels of CO2 we are approaching the point where increases must go far FAR beyond a doubling to have a noticable impact on absorption (and hence temperature). I personally believe that at current levels and higher, CO2 plays a trivially small role in atmospheric temperature. That doesn’t mean the cartoon is right. You have identified that there is theoretical prediction of a forcing. That is not the same as empirical evidence of warming. Anthony is correct. There is strong evidence that CO2 concentrations in the atmosphere started to increase abnormally around 1970. If CAGW is correct, then global temperatures should have started increasing abnormally at around the same time. There is no evidence that global temperaturess are behaving abnormally. On the contrary, global temperatures are behaving exactly as they have been doing for centuries. … So the negative evidence is that adding CO2 to the atmosphere has no effect on global temperatures. The mere rising of temperatures and rising of CO2 is observed evidence, it would be a logical fallacy to conclude causation, but it’s still evidence. But remember that Anthony’s cartoon is not about the existence of warming: it is about the lack of evidence for the magnitude warming induced by “extra CO2”. DO YOU HAVE ANY IDEA OF where the “absorption lines” of CO2 in the ATM are? Do you know how BROAD they are? DO YOU KNOW that they VARY from the surface (Lorentz broadening) to the Stratosphere (DOPPLER BROADENING) and that this has a dramatic effect on the overall balances???? The net result is that CO2 acts (as ELSASSER GUESSED, in 1942,, in his “On the IR Heat Balance of the Atmosphere”, but can now be calculated) as an “even exchange agent. UPFLUXING as much as it DOWN FLUXES. NET ZERO, until you get into MUCH higher concentrations than today’s levels. THE KING HAS NO NEW CLOTHES! THis whole thing is based on a PHYSICS FICTION. I’ve asked Kenji about this, and he says the calculations are ROUGH to do right. He’s competely correct. CO2 the great insulator .Used to insulate all over the place;in building walls,attics,etc. The other day i blew up a balloon and i couldn’t touch it it got so warm. Wasn’t sure about the physics,but hey the science is settled. I’d add to the various comments above that there are assumptions often made about what “3.7 w/m2 per doubling of CO2” actually means. It does NOT mean 3.7 w/m2 at surface. The definition used by the IPCC is all the downward photons (that otherwise would not have occurred) less the upward photons (that otherwise would not have occurred) = 3.7 w/m2. But that is a value that does not occur at any given point, it is in effect “smeared” across the atmospheric column from top to bottom. If you bother to read IPCC AR4 WG1 Ch2, you’ll discover that they actually state that the calculated RF can NOT (repeat NOT!!!) be used to directly calculate surface forcing (and hence temperature change at surface). This is just not a simple calculation! In fact, if you do a straight average using SB Law, you’ll discover that it takes 5.5 w/m2 to increase the average surface temperature of earth 1 degree, not 3.7! Of course that’s without adjusting for Holder’s Inequality…grumble grumble grumble…. complicated….grumble grumble…wish people would read the literature and understand the… grumble grumble grumble….definitions. Best counter programming = babes bouncing on trampolines. It may be hard to list all the reasons Gore is wrong while bouncing on a trampoline, but who cares? Lindzen and Tim Ball? Fun! Where’s Leif? Please record, replay, and divide into segments labeled by persons and subjects. This is for all those who cannot watch live, and those who want to have more to beat over the heads of the CAGW people, friends, acquaintances, enemies, strangers. @R A TAylor…this is work, lots of it. No guarantees. I’m doing what I can. Technology sometimes isn’t cooperative the way I’d like it. Hindcasting is a necessary but insufficient condition to indicate that models are in the “correct ballpark”. John Eggert and Steve Mosher are of course right to point out that it’s silly to deny established evidence. The question, however, is how that evidence applies in the context of the climate system. Maybe everyone else has read this article, but I learnt a lot, in particular about how most heat is transported from the surface by convection, not by IR radiation, which makes the absorbent properties of CO2 in the bulk of the atmosphere irrelevant. R. S. Lindzen, CLIMATE DYNAMICS AND GLOBAL CHANGE, Annual Review of Fluid Mechanics, 1994.26:353-78 at http://eaps.mit.edu/faculty/lindzen/166_Cli_Dynam.pdf It’s become conventional to quote estimates of climate sensitivity in terms of degrees C for a doubling of CO2, but I think that only makes sense if we assume a doubling of CO2 will be significant; we can equally well quote it in terms of degrees C per watt / m2 forcing, which can be used directly for any type of forcing, and maybe doing so would help us keep our minds clearer. To Richard S. Courtney- Thanks for writing the email I was going to write to Eggers. Good job! Since there would be no GHE, and consequently no forcing, if the environmental lapse rate were to go to “0”, I presume the “physics” you’re talking about is the environmental lapse rate. So what are these products that have been engineered based on the environmental lapse rate? This inconvenient fact is going to upset/be ignored by a lot of alarmists, especially those that like to describe themselves as ‘scientists’. “I’d add to the various comments above that there are assumptions often made about what “3.7 w/m2 per doubling of CO2″ actually means. It does NOT mean 3.7 w/m2 at surface. The definition used by the IPCC is all the downward photons (that otherwise would not have occurred) less the upward photons (that otherwise would not have occurred) = 3.7 w/m2. But that is a value that does not occur at any given point, it is in effect “smeared” across the atmospheric column from top to bottom. If you bother to read IPCC AR4 WG1 Ch2, you’ll discover that they actually state that the calculated RF can NOT (repeat NOT!!!) be used to directly calculate surface forcing (and hence temperature change at surface). Your efforts are enormously appreciated, and inspirational. Al-gore-ian junk science = dirty science. Posted a link to this Press Release/Update on The Hill, Huffington Post, and several other sites. I’m surprised to find a lack of coverage for the Gore event. Looks like the media has had enough of the spin. I’ll post some more updates in the morning and I’m looking forward to the broadcast. This evidence is lab based and field measurement based. We engineer working products based on the physics.There is no credible experiment or physics which contradicts this understanding. If `you could please direct me to the location of the 17,000 meter long apparatus that was used to simulate the atmospheric air column, I’d be most appreciative. What will be Kenji’s contribution? ………………………………….so long as it can be used to further THE CAUSE !! I assume this is Adobe Flash only. I know the other side was hoping for a strong El Nino to set a new record in 2013, but the latest ENSO meter just came out and it plunged from 0.42 to 0.12. Global warming evidence? Of course there is evidence that here and there, things have warmed up. There is also evidence that here and there, things have cooled down. There are also areas where the trend is flat. There are also a number of plausible explanations, some of which are natural in origin. When multiple competing explanations exists, and one or more are related to natural sources, the null hypothesis reigns. Plain and simple. The null hypothesis must be difficult to disprove. It MUST remain so in order for science to stay on it’s steady course and not be led willy nilly down the prim rose path by any one rogue group or individual person. Anthony – I don’t know if you saw this load of crap over the last weekend. This will surely get the progressives in their Starbucks shops up in arms! Take a look and laugh your rear off. My reply did not seem to go to moderation, so I am repeating it. If this is a duplicate please delete. Thank you Mr. Watts for replying to my request @ November 13, 2012 at 2:42 pm with Anthony Watts November 13, 2012 at 2:45 pm. I realize it is a lot of work and time is very short. I wish I could help, but I’m stuck here. I note Keith AB November 13, 2012 at 8:51 am said he was planning on recording the whole thing. Obviously this will be lower quality than recording on site, but if he or others do, perhaps it would be usable. It could even be turned into a presentation to give as proving we are not nut cases, and possibly may convince some open minded people, as the ones watching your live presentation will mostly be confirmed skeptics along with a few extreme CAGW who will pounce on the slightest triviality. It may be possible to even convince some cable stations to actually play a decent skeptical view. Thank you and everyone involved, especially the anonymous donor. Agreed. Parametric models are a form of curve fitting. It would be extremely surprising if they could not hindcast. Any model that could not hindcast would be immediately parameter adjusted until it did. A polynomial of order n-1 can exactly fit a curve of n points. A straight line fits two points. A parabola fits 3, etc, etc. This is basic mathematics. The better the fit you need, the more parameters you add. However, such a polynomial shows no skill at predicting the future any more than a coin toss or a dart board. If this was not true, then climate models could be adapted to predict stock market futures and use the winnings to convert the world to green energy without any need for increased taxes. If climate models actually could predict the future, there would be no need for climate scientists to get grants. They would have already retired long ago in their mansions and villa’s, living high on the hog off their tax free dividends and royalties, jet setting to the north pole to escape the heat. Are you THE Bill Taylor? Love the bowling reference! Yes Steve Mosher it is supported by the same stuff that MODTRAN is based on. Mosher et al, you obfuscate what the CO2 climate question really is. The question is NOT does CO2 contribute to climate, basic physics says it does to some disputable degree. The question is does MAN MADE CO2 contribute to climate to any significant degree, and that question you always seem to avoid. Do you know how much the moon weighs? did you put it on a scale. But if you think you have evidence that the forcing from doubling c02 is not between 3 and 4 watts, then claim your noble prize. If you want to know how its measured Google is your friend. You rely on the physics being correct every time you use your phone or wifi. Your country relies on the physics being right when it designs its weapons, in fact the testing of the physics used to be classified back in the day. But if you think you have evidence that the forcing from doubling CO2 is not between 3 and 4 watts, then claim your noble prize. Is this gross or net forcings? What if there was zero CO2 in the atmosphere and you doubled this? Would the forcing be between 3 and 4 watts? How about if the atmosphere was 100% CO2 and you doubled this, which doubled the volume of the atmospheric? Would the forcing be between 3 and 4 watts? What about the partial pressure of H2O as a result of doubling CO2? Doesn’t increasing CO2 necessarily reduce H2O as a result of partial pressure forcing H2O out of the atmosphere, long before any effect of global temperatures will result? Hasn’t this in fact been observed, that as CO2 has increased H2O has been dropping? Since H2O is a stronger GHG than CO2, doesn’t this mean that adding CO2 will actually REDUCE the NET GHG in the atmosphere, by reducing the H2O as a result of partial pressure? Which means that again adding CO2 will not have a NET forcing of between 3 and 4 watts, because the H2O will be reduced before temperatures can increase globally. Hold on, I can hear the Nobel Committee outside my door. can you guys put these up on Youtube afterwards as individual video’s so we can link to them on our social sites and promote the truth? I never said any such thing. In fact, if you had paid any attention at all, you’d know that I’ve spent a considerable amount of time on this blog explaining that CO2 really does absorb and re-radiate, that 3.7w/m2 is a fair approximation, and that cool things can actually make warm things warmer in comparison to there being nothing there at all instead. That we have proof of same by comparing temperatures of bodies with no atmosphere (such as the moon and Mercury) to the temperatures of bodies with an atmosphere such as Earth and Venus. Your interpretation of the physics beyond that however is very weak. Your example of military technologies for instance, you’ve claimed above, and cited in other threads specifically radar as an example. As I commented on another thread when you used that example, we know a great deal about radar and things like radio waves precisely because they do NOT get absorbed to a great extent by the atmosphere. Your idea that this notion extends to our knowledge of LW is ridiculous because it is the exact opposite problem. LW does get absorbed, and we can only measure this absorption indirectly, making our knowledge of how it interacts with the atmosphere exceedingly weak by comparison. Further, your claim that we know by experiment and field measurement exactly how LW and CO2 interact in the atmosphere is also false. We cannot know by experiment because, as I tried to point out to you, it is impossible to build an apparatus that simulates the atmospheric air column. Not only can we not build to scale, we cannot simulate water vapour at at the bottom of the column at tens of thousands of ppm and declining to a few hundreds of ppm or less at the top. We cannot build an apparatus that simulates air currents, changes in pressure, water vapour condensing, water droplets turning to ice crystals, ice crystals melting, and water droplets evaporating, all at the same time at different altitudes. As for field measurements, yes we can measure upward and downward LW at surface, and we can measure upward LW at Top of Atmosphere using satellites. This doesn’t give us a complete picture however. To a sensor in space, or on the ground for that matter, a LW photon arrives, but the sensor cannot tell from where it originated. A photon escaping from TOA may have been emitted from a CO2 molecule a few meters away, a few hundred, or a few thousand, or from the surface. Your sensors can tell you how many, but not from where. Nor can they separate out fluctuations in intensity due to all those factors I listed in the previous paragraph constantly being in flux. We can make educated guesses about these things, but until we have massive amounts of data from very small increments in altitude, from surface to TOA, combined with the exact conditions of all those variables at each instant in time (and more, those are just a few) we are just making educated guesses. We cannot directly measure the effects we are trying to quantify precisely because the atmosphere plays havoc with the path of photons in the CO2 absorption bands. We know a great deal about radar for the precise reason that the atmosphere does NOT play havoc with those frequencies. Any attempt to claim that we know about one effect because we know about another is puerile nonsense. If you had paid attention, I also explained in this thread that the 3.7 w/m2 is an artificial concept. It is arrived at (according to the IPCC’s definition) as the downward photons (that otherwise would not have existed without CO2 doubling) less the upward photons (that otherwise would not have existed) which does in fact (by my calculations 30 years ago when I was still doing that kind of math) come to somewhere in the neighborhood of 3.7 w/m2. (If memory serve, my crack at it 30 years ago was 3.9 w/m2, and the two PhD’s in atmospheric physics that I was conversing with on the matter came in at 3.5 and 4.1 w/m2 respectively). This 3.7 w/m2 however, is an abstract concept. It is not like the 1342 w/m2 of insolation that arrives at TOA. We can measure that. We can measure how much arrives at earth surface too, and we’ll get an exact number at any given point in time and space. This is not true of the 3.7 w/m2 as defined by the IPCC. It cannot be measured at any given point in time and space, because it simply does not exist at any single point in time and space. It exists as tiny incremental changes in downward w/m2 strewn from the bottom of the atmospheric column to the top, which collectively add up to 3.7 w/m2. As I attempted to point out upthread, this does NOT translate directly into surface forcing, nor does it translate directly into surface temperature change. The IPCC is EXPLICIT on this matter in AR4 WG1 Ch2. In fact, if we applied straight forward physics to the matter, Stefan-Boltzmann Law would require 5.5 w/m2 to raise the average temperature of the earth from 15 degrees to 16 degrees C, not the IPCC’s 3.7 w/m2. The 3.7 w/m2 = 1 degree is arrived at in part by Holder’s Inequality, and in part by assumptions regarding the impact to the lapse rate that result in a higher temperature increase at surface than can be justified on the basis of CO2 doubling = 3.7w.m2 and the application of SB Law alone. We have neither the lab experimentation nor the field measurements to untangle these matters with any but very approximate precision. I doubt I shall ever win a nobel prize, but sir, your laughter is uncalled for and you are arguing physics at a level well over your head. Mosher, your estimate of the absorption and radiation of heat by CO2 is plain wrong. One can make some calculations from the test work carried out by Prof. Hoyt Hottel (Professor of Chemical Engineering at MIT and world expert on radiation heat transfer and combustion) represented in graphs and in equations. His work is well known to Engineers dealing with heat exchange, processes and combustion. However, no calculation can be accurate because of varying condition. In every systems whether open or closed there is convection which is/seems to be ignored by physicists and other scientist who have no experience or understanding of heat transfer. John Eggert convection also takes place in the top of a blast furnace. I have measured heat transfer in different processes and equipment. Even with flame temperatures in excess of 3000C convection is significant particularly if the flame licks the material in the process or gas passes through a solids bed eg blast furnace. The lower the temperature the more significant (in percentage terms) is convection. For a surface at 50C in the atmosphere with a wind blowing convection exceeds radiation. One thing for sure is that a coal flame with an emissivity close to one radiates more heat than a nozzle mixed natural gas flame which has an emissivity around 0.45. The emissivity of the latter natural gas flame (slight blue and transparent) is nearly totally due to the water vapor. Heating on a gas stove in the kitchen is mainly due to convection. CO2 makes an insignificant unquantifiable contribution to the heat transfer between the earths surface (of which water surfaces make about 70%), the atmosphere and outer space. Doubling CO2 has even less effect (eg zero) because of the logarithmic relation of absorption/ emission. I have no problem with the cartoon..
John Eggert does your blast furnace have ice in it? That is why your statement on adding energy raises temp needs “in general” in it. Heating ice water does not raise it’s temp. That exception is part of climate. The cartoon says CO2 raises temps, just we can’t meausre how much. How much is used converting ice to water, or water to gaseous H2O? You seem to have skipped the “how much extra” part of the statement. Your claim we generally know does not contradict this. C. Figueres, Exec. Sec’y, UNFCCC, probably: Gore’s trainee has less than two months ’til expiration of Kyoto Treaty. Do you have more up to date figures for al gores mansion? I believe that he has installed solar cells to reduce reliance on grid electricity. Hmmmm, let me see now. If scientist makes empirical observations related to CO2 climate sensitivity, as soon as those observations are touched by the filthy arithmetic they become invalid. I’ve donated a hundred dollars to get the ball rolling so that maybe he CAN host his effort without ads, and there’s a few hours left before the thing starts, (assuming I’ve got the time difference right from Oz,) and I was wondering if there’s anyone else out there with a few spare bucks that might be able to help out as well?.. Anthony comment sounded a bit frazzled, the bloke’s doing the world a bloody big favour by doing this, whaddaya reckon?? If it wasn’t for wuwt, where would Al get his publicity from? 5. The denial and/or derision of natural climate cycles. Computer models have become steadily more accurate at hindcasting the past and if you are a modeller they are probably a beautiful thing to behold. The problem obviously comes with forecasting, where the same time proven logic of GIGO applies. Climate modellers simply refuse to grasp the fact that if you put 10 correct factors into your models, there will be scores of other factors which will not be correct, because we simply do not have a good enough understanding of exactly how climate actually works – alarmists will obviously tell you otherwise, as they have to justify themselves. Of course, another problem with climate models is that the modeller will clearly want to prove his point about global warming and/or CAGW and that inevitably means they will be constructed with that bias included. Anyhow, all the very best with your program of goring the Goreathon, his pompous abuse of the scientific facts deserves all the slicing and dicing you can give him. I won’t condemn before broadcast but the preview suggests it’s aiming to confirm AGW. The special has been “made with close collaboration from the Bureau of Meteorology” so there’s a fair chance it’ll be ABC providing BOM PR, the common cause reminiscent of BBC climate policies. Just tried the test feed. It froze my computer (HP 2000-2190X running Windows 7). Had to do a manual reboot. Starts 09.00 Thursday morning here in Malaysia, Singapore, Indonesia. Plus 08.00 in Thailand. Guaranteed a good days viewing, hopefully. I am running an Apple MacBook with OS X 10.8.2 and Chrome browser and WUWT-TV is running well without a hitch so far. More problematically is getting my VLC to record the stream to my USB hard disk. Anyone with VLC experience ? Good to see the thread being hijacked by mosher-snark. If you can, Anthony, move his segment to 3am est. Best of luck on the broadcast. Break a hockeystick. Windows xp home, older computer, Firefox 16.0.2 browser. No problems with the test stream. Make sure to check and monitor the lip sync, it can drift over time. Good luck Anthony! How much is that in GMT? I would quible with the cartoon at the top. There is observational / empirical evidence for how much the global temperature is warmed by CO2 (all other things being equal). It is the basis for mass balance calculations in blast furnaces. These too are based on calculations and models. Hey warmers, do I have to accept the Hockey Stick, massaged data, activist written IPCC reports, and Hide-the-decline as valid scientific evidence too? Proghole politicians promise to spend billions (and tax us trillions) to limit CO2 but they have NO way of calculating what the actual effect. How stupid are we to allow this? I find it very good once you get the hang of it. It converts into Quicktime or VLC. Thanks John, you’re a peach. Further, your claim that we know by experiment and field measurement exactly how LW and CO2 interact in the atmosphere is also false. We cannot know by experiment because, as I tried to point out to you, it is impossible to build an apparatus that simulates the atmospheric air column. I would surmise that even if we could either build such an apparatus or create a model that precisely reflects what physically happens in that atmospheric air column the fact that every atmospheric air column on Earth is constantly changing would make any result from that experiment/model extremely difficult to relate to what actually is happening. If, for example, we determined it would take 30 minutes for the temperature of that column to stabilize (accepting that with no other outside influences it would) since virtually every millisecond the actual atmospheric column’s characteristics would be changing, the minor effect of CO2 may never be discernible. The theoretical maximum amount of warming that a certain level of atmospheric CO2 would cause would never be realized and may very well not be measureable with modern equipment if at all. I agree there’s woefully insufficient evidence for making any sort of solid conclusion on what the magnitude of warming induced by extra CO2 might be, but I still think it’s a bridge too far to say there’s no empirical or observational evidence at all. I just don’t want us skeptics becoming or coming across as being the deniers we’re always accused of being and certainly wouldn’t want us to hand (on a silver platter) evidence that we deny even one iota of empirical/observational evidence to the alarmists. I believe it is of the upmost importance that we are and appear to both the casual observer and new questioners of the establishment to be the ones looking at the big picture and considering ALL the evidence. We need to be absolutely clear that there isn’t any evidence that is required to be ignored in order to be skeptical of the alarmist position. This is weird, as for the first time in agood few years I have to work tonight, but I hope to catch most of the broadcast when I get back from around 1am! break a leg, or whatever…. What a lot of discussion on the effects of CO2 in the atmosphere. Can I add my layman thoughts? I read that 46% of energy of incoming sunlight is IR. Therefore CO2 must be absorbing all it can at 2.7 and 4.3 microns while the sun is shining. Looking at the temperature and energy levels it seems CO2 if far more effective at shielding the surface from IR that has some real heating effect during daylight compared to the ‘warming by backradiation’ in the 15 micron band at night. Especially as 15 micron radiation can only warm things up to -80C. Certainly not that cold where I live. Umm… Pi is a static ratio – it has no units. I think that the only way you could get it to be exactly 3 would be if you were to modify some aspect of the dimensionality of our universe – perhaps the spacial curvature? Anthony asks about corrections to Gore’s experiment and that’s fair enough, but I am more concerned about the movie “An Inconvenient Truth”. A UK court ruled it could only be shown in schools if teachers identified the political bias and the nine scientific errors. Is that happening? The government produced the brochures, but I doubt they are being used. Gore incorrectly claimed the court ruled in his favour. It didn’t. In addition, people identified many other errors. To my knowledge these errors have not been corrected. The movie is still for sale on his web site. I also understand it is still being used by Gore trained ‘disciples’ around the world. Contrast this with the action of Martin Durkin, producer of “The Great Global Warming Swindle”, who withheld at is own expense, release of the DVD until one very small adjustment to a graph was made. Gore is calling for social responsibility, but apparently fails to meet his own by continuing to distribute an inaccurate movie. Now that’s an inconvenient truth. UNFCCC Exec. Sec’y, C. Figueres may well be a disciple: her CV states she was trained by Gore. Her appointment satisfied two quotas: a woman from a non-developed state. What happens when the ‘Framework’ – Kyoto Treaty – expires in January 2013? Two points: 1). Ustream test works well on iPhone 4S. Except that they don’t use empirical data. They use parameterized models only as proof, with a large sensitivity one of the parameters. Almost all studies on empirical sensitivity show a small or even negative sensitivity. Why do you need to prove your name each posting? Addendum to comment on CO2 in fired furnaces: CO2’s radiative effects occur in all of them. Repeat, all. Not in a select fraction, and ignoring the others. Atmospheric CO2 plays favorites, completely ignoring some cities, counties, and entire regions. I posted the Webcast information to several news outlets including CNN, Fox News, Forbes, The Hill, and several stations in Alaska and Hawaii. I also posted on Climate Etc. and JoNova. I’ll continue posting until the program starts. I have been watching your first official press conference since your reelection. i heard you make a number of statements regarding Climate Change which are not true. I would suggest, Sir, that you are receiving some bad advice. I humbly suggest that it might be in your (and the nation’s) best interest to re- evaluate how you are advised on this matter. The BBC is to revamp its science coverage after an independent review highlighted weaknesses and concluded that journalists boosted the apparent controversy of scientific news stories such as climate change, GM crops and the MMR vaccine by giving too much weight to fringe scientific viewpoints. The wide-ranging review found the network’s science reporting was generally of high quality, and praised the BBC for its breadth, depth and accuracy, but urged the broadcaster to tackle several areas of concern. Commissioned last year to assess impartiality and accuracy in BBC science coverage across television, radio and the internet, the review said the network was at times SO DETERMINED TO BE IMPARTIAL that it put fringe views on a par with well-established fact: a strategy that made some scientific debates appear more controversial than they were. By Richard Black and Roger Harrabin. Two significant climate conferences in the next few weeks offer the BBC a huge opportunity to improve our audiences’ understanding of this fraught and complex issue but they also present a challenge to the BBC to ensure that we report impartially. Because if we do not have a strong grasp of the fundamentals of the climate debate we risk presenting our audiences with a set of opinions which is out-dated, DRIVEN BY SPIN OR SIMPLY WRONG. Newsnight, Look East and Radio 4 all chose to disregard UKIP and treat the Greens as the main story. Three days before the poll, the BBC’s Eastern region TV held a hustings meeting for four candidates: Conservative, Labour, LibDem and Green. What was the result in the event? UKIP won 11.8 per cent of the vote – comfortably ahead of the Greens and remarkably close to the LibDems (or “worryingly close” as I just heard a Radio 5 Live presenter put it). Did our state broadcaster apologise for its mistake? No, alright, that would have been expecting too much; but was it, at least, a little abashed in its tone? Nope. It simply edited UKIP out of its coverage. On the one o’clock news, a little bar chart came up to represent the results: blue for the Conservatives, red for Labour, yellow for the LibDems and, er, green for the fifth-placed Greens. The party that had come fourth, and been just 800 votes behind the LibDems, wasn’t represented. Nor was UKIP mentioned on the contemporaneous radio news. Global climate change a Catholic responce. Read activity #1: Climate change situations. I can here what sounds like conversations regarding setup on the Ustream video channel. It just changed to background music. Access to the link is denied. Should I cover Europe as well? BTW if you have a twitter account write tweets with a URL back to here with the hash tag #dirtyweather – you will show up on the climate reality project home page.. The great thing is if they even do implement a filter on their feed – on twitter what you write will still be there.. So spread the word! Also from the look of the wording of the tweets coming in there has been a mass emailing to the faithful complete with a few tweet templates to use.. marketing fail – very evident that the tweets are manufactured. Thanks ecoGuy, I’ve avoided Twitter like the plague but on this occasion will open an account. typo: United States Senator James Inhofe Not Jim! Noble prize, or Nobel prize? You don’t need any scientific facts to get the Nobel Peace prize. All you need is a political agenda that fits the lefts imagination of “doing something good”. It might not be good at all, it only needs to fit the current imagination of what the left think is good. Even though the Nobel Peace prize has made us Norwegians look very foolish many a times lately, believe it or not, there still are a couple of really noble scientists here. People who dare saying what they think is true based on the scientific method, instead of just singing the commonly accepted tune. Will the “regular” site still be open for comments? My system still requires a hammer and chisel so I may not be able to view the live stuff. I’ll find out then. trying to use the once forbidden “weather is not climate” meme. Surely you mean the once-forbidden “weather is climate” meme. Please correct, as it makes no sense as is. For every time Al Gore gets on the show with something, something weird always happen to the “climate” or its society. 3 hours to 24 hours of insight — headed out to buy some popcorn. hmmm — where is the “presenter schedule”? The Money and Connections Behind Al Gore’s Carbon Crusade. Will the show pause at the commercials or can we click and skip them ? I’ve heard that UStream adverts are incredibly annoying – I’ve never seen them myself since the free Firefox add-on “AdBlock Plus” has automatically removed them any time I’ve watched UStream. Just did a test of the TV screen here in Oz and the ad shown before the color bars was completely distorted and noisy unlike an early ad posted . The “music” however after it was OK. Just to let you know. 30mins to 24 hours of insight and counting. The comments are atrocius tripe. Is there anyone with a brain there? Turn down the microphone gain. FYI: Google “Dirty Weather”. WUWT-TV came up as #8. Not bad. At 9.41 pm in Melbourne Australia (AEDST) I tuned into the broadcast from the Bishop Hill site. The following scren cap shows an organisation with a different agenda trying to take over. Noted speakers are Don Henry, an activist for decades and David Karoly, whose name is known to some. The WUWT aqudio is barely audible behing the barrage. Good reception, all night, here in Central America. However, at about dawn, everything stopped. Google responds the page is unresponsive. Who organized this? Who is paying for this? REPLY: A single private donor, not affiliated with any climate/NGO/political organization (a businessman in Florida) purchased the Tricaster equipment and cameras, I purchased the audio equipment and accessories with donations from WUWT viewers. I’m donating my time and expertise to setup, operate and broadcast using my own network infrastructure, and for now (until we can get the paid version) we are using the free streaming on USTREAM. I think I’m inflating Al Gores viewer # each time I go to snicker.What if all his traffic is from WUWT? OOPS! I accidentally used “fr**dul**t” in a previous post. Lesson: cool off first. Thanks for posting it anyway. Mr. Watts, don’t kill yourself doing 24hr. shows. If you do another, get a cohost(ess). I’m a very very very ex software designer, super-programmer, and occasional teacher; and in my prime frequently worked 16 to 20 hr. days and 7 day weeks for months at a time, with occasional 60 to 72 hr. continuous sessions for a change of pace. A labor of love; I would have paid to do what I was doing. However, it takes a toll, a very great toll. I hope you managed to sleep during the overnight prerecorded portion. I repeat, don’t kill yourself doing things like this; you are needed where you are. There is no replacement in view. I even enjoyed “chriscolose’s” comments. Actually he sometimes was on point if authoritarian and belligerent. Those failings are frequently the case in the young and highly educated, especially undergraduates, grad students, and new PhD’s. ; more particularly those educated beyond their intelligence the world hasn’t beaten some wisdom and humility into. The most amazing was Dr. Ryan Maue and IPCC now completely undercutting Al Gore’s “dirty weather” and Obama’s concurrence with it in his recent speech, at least regarding hurricanes. Will you post the number of watchers at various times?. Did you reach any besides confirmed skeptics and a few CAGW people? In other words was everyone just “preaching to the choir”? Did you manage to record everything? Obviously the prerecorded segments can be made available with appropriate permissions. Can anything else? Have people go over everything beforehand, especially use of Skype and Power Point. Have someone else to help you at your location or through a remote connection. Get a cohost(ess) for long shows. Try all connection well ahead of time, and immediately before needed. Post the qualifications, affiliations, publications, awards, web sites of the speakers. Anybody know why Judith Curry’s Climate Etc. blog has been taken down? It’s supposedly for a “terms of service violation”. Is there something else behind this? “Global warming” has been, is and always will be about the money. The MODTRAN program was developed for the Air Force to calculate microwave background levels in the atmosphere from measured line spectrum data. It allows modeling or expected radiation levels in standard atmospheres for the purpose of weapon system calibration. It is available as an online web utility from the University of Chicago. This plot shows that the 15 micron (666 cycles/cm), CO2 absorption band is equivalent to a one-foot wide tree in the middle of a ten-foot wide stream. Note that the blue curve for calculated radiation escaping the Earth at a hypothetical 600 PPM CO2 concentration exactly overlays the green curve for 300 PPM for most of the plot except for small regions on the edges of the CO2 band. MODTRAN seems to indicate a raw CO2 temperature effect of one degree C for each complete doubling of the CO2 concentration in the atmosphere and that relationship seems to hold from 20 PPM to well over 1000 PPM. Even the IPCC rates this as a logarithmic effect, however they state values from 2.2 to 3.3 degrees C for each complete doubling, perhaps by assuming that the rapid global temperature rise of the late twentieth century was all due to increasing CO2 and a dangerously high, positive climatic feedback effect. The slowing global temperature rise of this century does not seem to match that assumption.